Accountants for Doctors: More Needed in the Face of Medical Advances? “SOME of the most anticipated medical breakthroughs of the decade are expected to be announced in Melbourne during 2014 as the medical research world gathers for the 20th International AIDS Conference. Particularly, there will be trials in 2014 to test a drug, derived from the bacterium responsible for acne, that is expected to treat advanced multiple sclerosis. Tests will also be done to try out a “trauma vaccine” that paramedics can use to save bleeding patients on the way to the hospital. Scientists are also looking into developing bionic devices to help treat Parkinson’s disease and epilepsy, among other conditions that involve tremors. Moreover, they are working on a “bionic spinal cord” that can have paraplegics controlling robotic arms in five years. Even if a number of the studies are expected to be completed within the decade, none of the treatments, vaccines, and technologies can be expected to be available in the near future for all medical facilities and hospitals, much less private practices. Availability might be influenced by factors as simple as distribution, or by ones as decisive as cost. Nonetheless, having all these cutting-edge resources should not remain a pipe dream for both patients and medical practitioners alike. While many of the heralded advancements remain in the hands of researchers, medical practitioners might want to formulate plans on how they can eventually acquire and offer these new treatments. 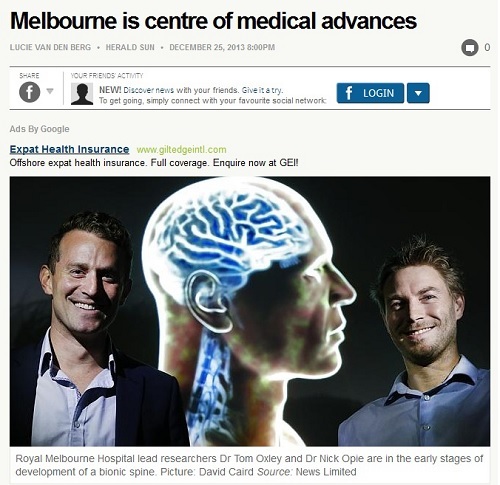 Forward-thinking accountants for doctors in Melbourne might be able to help them in this regard. These professionals can help medical practitioners implement financial strategies, manage their incomes, and maximise tax refunds so they can build a fund for future investments that will equip their practice and better serve their patients. Organisations such as MEDIQ have chartered accountants for doctors who can assist the latter in meeting this goal.